The name Bonham has been synonymous with powerful heavy rock drumming for over four decades. Ever since John Bonham burst onto the scene when Led Zeppelin exploded with the release of their debut album in early 1969, the mold was cast. That of an explosive thunderous drummer who when needed, sounded like cannons being fired, yet still was capable of subtlety and grace when the occasion called for it. It was that power which helped propel the British rock legends to massive fame and fortune,and into legend in the 1970's. That amazing talent led to him being generally recognized as one of, if not the best heavy rock drummer in history decades after his tragic passing at the age of 32 in 1980. Born in 1966, the world at large got its first glimpse of a young Jason Bonham with the release of the Led Zeppelin film 'The Song Remains The Same' in 1976. Appearing alongside his father, drumming on a scaled-down kit, it was a foreshadowing of things to come. By age 17 he joined his first band Airrace, and in 1985, he joined Virginia Wolf, recording two albums and touring the U.S. supporting The Firm. In 1988 the Bonham legacy came calling twice, as first he joined guitarist Jimmy Page for his 'Outrider' album and tour, then in May he took over the drum spot as the remaining three members of Led Zeppelin reunited for the Atlantic Records 40th Anniversary concert in New York City. The next year saw him forming his next band Bonham, whose Zeppelin-inflected debut release 'The Disregard of Timekeeping' spawned the hit single "Wait For You", its attendant video being a mainstay on MTV during the period. Despite such success however, the band's next album 'Mad Hatter', released in 1992, failed to meet expectations, leading to their disbanding shortly thereafter. The 90's also saw him hook up with legendary British blues rock belter Paul Rodgers, drumming on all tracks of the Grammy nominated 'Muddy Water Blues: A Tribute to Muddy Waters', leading to an appearance at 1994's Woodstock II with Rodgers and guitarist Slash. Two other solo projects transpired, 1997's 'In The Name Of My Father -The Zepset' and 'While You See The Sun', both of which having connections to his late father. The first featuring the songs of Led Zeppelin, the latter seeing Bonham once again appearing alongside his dad via sampling on several tracks. In 1999 Bonham joined Indianapolis based blues rockers Healing Sixes, recording the Kevin Shirley (Aerosmith, Led Zeppelin, Iron Maiden, Joe Bonamassa) produced 'Enormosound' which was released to critical acclaim in 2002. Leaving the band in 2003, he soon found himself invited to join English hard rock legends UFO. During his tenure with the band they released a studio album 'You Are Here' and a live DVD 'Showtime', both of which were very well received. During this time, from 2004 to 2007 and part of 2007 to 2008 he also found himself playing live as part of a reconfigured Foreigner. In December 2007 his profile was heightened immensely when he once again filled in for his father at the historic Led Zeppelin reunion show at London's O2. Demonstrating that he is the only rightful heir to the drummer's stool, if and when that band might choose to reunite again, it was an affirmation of his ability to rise to the occasion and do justice to his father's legacy. Recently we had the wonderful opportunity to catch up with Jason to discuss the powerful new album he has recorded with vocalist Glenn Hughes, blues guitar god Joe Bonamassa and keyboardist Derek Sherinian, collectively known as Black Country Communion. In a band filled with masters of their craft, his drumming on the record stands out as a robust example of classic British rock power, and is a performance which would surely make his dad proud. Nightwatcher's House Of Rock : I'd like to first talk about the new album 'Black Country Communion' which is coming out on September 20/21, with you, Joe Bonamassa, Glenn Hughes and Derek Sherinian, collectively known as Black Country Communion. Now that the album is finished, how are you feeling about the results? Are you pleased with how the album turned out? 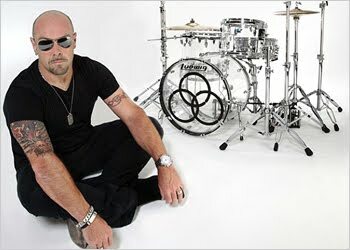 Jason Bonham : I'm very pleased. I was listening to the songs on the way in, and it wasn't even finished yet and it sounded great. All the studio work was finished in the matter of about six days, from start to finish, then about two or three days to mix. It's definitely the fastest thing I've ever done. But listening back to it now, I'm very pleased with the performance. There's some really cool songs on it. One of my favorites would definitely be "A Song For Yesterday", but all of it I'm really pleased with. NHOR : How do you feel about your performance on the album, compared to what you've done previously? JB : On that side of it, I'm very pleased as well. I love on "Too Late For The Sun", the last track on the album, where we just recorded the live jam, had a bit of fun, and we just go for it, ya know? There was no editing of the performance, everything was left in there, as we say in England, "Warts and all" (Laughs) There were no overdubs, and even with the mistakes left in, it sounds great. It was a lot of fun recording that. NHOR : Just from even a cursory listen to the album it's quite evident that there's a strong chemistry between the four of you. Was that something you felt right away? JB : I've known Joe for a long time. I've played with him before, on his 'You & Me' album, and he's just a phenomenal musician. I'd never played with Glenn, or Derek before, but in the studio, we just started playing, and it sounded fantastic. I never really took the time to listen to anything played back. It was more like, "Okay, we're done with this one, next!" But as I said, I'm extremely pleased with how the final product came out, it really sounds great. NHOR : You just mentioned the fast paced process of recording this album. Kevin Shirley is known for going in and getting things done in an efficient manner, very quickly. Which is the way many of the bands such as Led Zeppelin, Deep Purple, Black Sabbath did it in the late 60's, early 70's. You've mentioned that you've never really worked this way before. Now that you have, are you comfortable with this approach to recording? JB : No. (Laughs) I mean, I just like to know the songs before I go into a studio to record to get the best performance. I feel on some of the songs I could've played better if I'd had more time. The ones I did feel very comfortable with, it shows on the album. On others, I just kind of went for it, and just did it how I felt it. If I could have had my way there are a couple songs that I wish we could have re recorded, but we didn't have time. But overall, I'm really, really pleased with it. I just thought that I could have done better on certain songs. NHOR : Glenn has described this as being a big rock album. Another word I would use to describe it would be epic. With that in mind, where do you see the band fitting into the marketplace of today? Do you feel that people are starving, musically speaking for an album such as this? JB : I don't know. I don't really take things very seriously like that these days. I look at it as a piece of music that I've played on that I'm very pleased with. I try not to expect too much from anything these days, because you'll just end up being disappointed, ya know? I just hope that people will at least like us individually, and hopefully collectively. That they hear that we're doing our best. I do think that if we do take this on the road, and people hear us live, it will be monumental. NHOR : Do you foresee this as being a one off project, or based on the results, would you like to carry on with Black Country Communion for more than just a single album and tour? JB : I haven't really spoken with anybody about that, so I don't know how everybody feels. But we will see. It may be difficult balancing out all our schedules. I would love to though. NHOR : Ever since the Zeppelin reunion at the O2 in 2007, it seems that attention on your activities has been magnified it seems tenfold. Which means that along with Joe's increasing popularity and Glenn and Derek's pedigree that there are a lot of expectations for this album, which is being labeled as a "Supergroup". How comfortable are you with that tag? JB : Yeah there is a lot of expectation.I only hope that people see it for what it is. Kevin has done a great job producing the album, and it's as much to Kevin's credit that it sounds as good as it does as it is any of us. NHOR : As you stated earlier, you previously worked with Joe on a cover version of the Zeppelin song "Tea For One" on his You & Me" album in 2006. Joe and Glenn decided to begin the process of putting this band together after they performed together at the finals of the King Of The Blues competition at the House Of Blues in November 2009. How did you come to be involved in the band? So I never really thought of it as a big thing until I got down there, and started playing. Then they said, "Hey, let's call it Black Country". Then there was that whole thing about another band who had that name, so Glenn said, "Let's add Communion to the name". It actually became more of a band after we recorded the album. NHOR : You've worked with some very illustrious guitarists in your career, from Jimmy Page, to Vinnie Moore, Neal Schon... Slash, and now, in this band - Joe Bonamassa. I'm going to put you on the spot here Jason and ask you how would you rate Joe among all the guitarists you've worked with? JB : He's phenomenal. Definitely he's a phenomenon, a new entity who has to be reckoned with. He's such a sweet guy, and he's just going to keep getting better and better. There are parts on this album where he's just earth shatteringly brilliant. He's a fantastic guitarist. NHOR : While you've been a member of UFO, Healing Sixes and Foreigner in the past decade, this is the first band that you've been part of the formation of since The Jason Bonham Band, with whom you recorded 'When You See The Sun', which was released in 1997. Does it feel good to you to be back in a band that you're a part of from the ground up? JB : Well, I was in a band for a year after the reunion at the O2, with Jimmy Page and John Paul Jones writing material, so this is actually not the first one. But it didn't come out. That was a very good time in my life as well, just jamming with them, and coming up with material. Even though nothing came out, that felt more like a band than this. NHOR : You touched upon this a little while ago, and there was a bit of turmoil surrounding the band a little while back, with the legalities regarding the original name of the band Black Country. After that, there was some friction reported between members of management, which was said to even jeopardize the album's release. Did you ever have any doubts that this album would come out? JB : Yes, very much so. Definitely there was some turmoil over legalities between managers. It was just a case of well, I've been managed by someone for many, many years, you've been managed by someone for many, many years type of thing. Where they all want the very best for their artist. So there was some turmoil to get through, but in the end we worked things through, and we came to an agreement. Then it was, "Okay, let's continue on". But it was harsh. What was worst was there was some kind of bad talk , some trash talking being done on websites. I'm not into that. I don't believe you should air your dirty laundry on a website. I wasn't happy about that, but we got past that. NHOR : What about a tour with this band? Are there any plans that you know of at this point? JB : I haven't been told about any touring yet. I'm still waiting to hear about that. I know Joe's quite busy. But I'm willing to tour. If they want to tour, I'm willing to go out. I think this would be a great band to go out on the road with. But that's not up to me. NHOR : In March the four of you made your first live appearance at the Riverside Municipal Auditorium, in Riverside California as the encore during Joe's show there. What was that experience like, performing together live for the first time? JB : It was all very rushed. But it was pretty cool. It was what it was. I wish we could've just gone out and played a few complete shows, as the band would've really come alive then. NHOR : Next month you'll be going on tour in North America with “Jason Bonham’s Led Zeppelin Experience,” which reportedly is going to be a multimedia tribute to your father and the music of Led Zeppelin. This is set for 30 dates, in tribute of it being thirty years since your Dad's passing. How did that come about? JB : I got the idea for doing this after the Zeppelin show. I went to see The Beatles tribute 'Rain', which is one of the shows that Annerin Productions deal with. I could see how I could do this. Of how Led Zeppelin has been a part of my life. So it's kind of my life, with the music of Led Zeppelin. The time line will be all the way from the late 60's all the way up to the O2 gig. The one thing I didn't want to do with it is go out there and just be a tribute act. I really wanted to spend some time and really make it something special. A lot of it's planned around the 30th anniversary of his passing. NHOR : Are there any other details that have been solidified regarding the shows, in regards to musicians, what the presentation will be like? JB : Yes, the band has been rehearsing in L.A. But the members of the band will not be announced until the night of the first show. NHOR : In regards to this, you've said that you would love to have either Jimmy, Robert or John Paul Jones join you for an appearance or so during the dates. Have you made any calls to any of them? Will you make that call? JB : Robert actually awhile back came on a radio station with me, and the DJ talked about it. He said, "Well, Jason's doing this tour with the music of Led Zeppelin". Robert said, "Jason, you don't need an excuse to do it. You can do it anytime you want, with my blessing. Nobody else can play the drums like you. The only guy that did is unfortunately not with us anymore. A lot of people say that they can play the drums like that, and they can't. So, as far as I'm concerned, you can go and enjoy yourself. You have my blessing". That was a wonderful thing for him to say. First and foremost, we're going to do things right with this show. We're going to show respect to my Dad. It's going to be a lot of fun. There's going to be some sad moments, happy moments, but at the end of the day we're going to celebrate his life, not his death. NHOR : Your father is quite rightly considered one of the best, if not the best drummer in rock history. How difficult has it been for you to establish your own identity as a drummer?. You've been living with that legacy over you since you've been born. Has that ever been a weight on you? JB : I think it did. At a certain point of my life, it increased my drinking. I think you can get very bitter and twisted. In my sobriety though I've accepted it. You can't avoid it, you know? It's something that will always be there. Yes, it can be a hindrance, but it's also a blessing. In my sobriety though, the idea is that I just embrace it. You just become happy that you're associated with that kind of legacy. NHOR : I understand that your son Jager is also following in your footsteps, and is a drummer as well? NHOR : Every band or artist has them. What has been your most "Spinal Tap" moment? For more information on Black Country Communion go to this location. For more information on Jason Bonham go to this location.